As our leaders forge a new path forward for our environment and public health, we will be focusing on three major policies that we’ve been working on for years. Now that we have the right people in office who are listening to their constituents and reflecting their deeply-rooted shared conservation values, the door is finally open to make progress on these important issues. After eight years of the most anti-conservation Governor New Mexico has ever had, there is progress to be made on every issue you care about. Read more about the priorities that are the first critical steps we must take to help correct our course and make progress on the climate crisis and environmental injustices impacting our communities. One of our most powerful tools to achieve our collective vision of an equitable and inclusive New Mexico is our annual Conservation Scorecard. The Scorecard is a cornerstone of our work to connect you to the issues that matter. It provides the information you need to determine whether your legislators are voting in line with your conservation values. 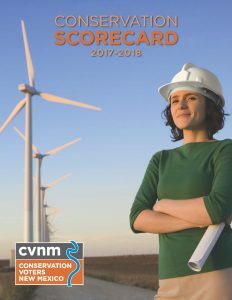 Find out how your legislators are voting on issues impacting your air, land, water and health in our 2017-2018 Conservation Scorecard!